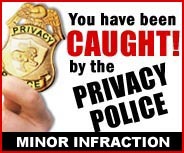 Privacy Police graphics (jpg files) - a humorous, but effective, way to let your employees know they've been caught with an information security infraction. These may be used during formal audits, spot checks, quality control checks, training and in other ways you find effective. There are two versions, a "Major" incident and a "Minor" incident. "We restrict access to your personal account information and we maintain physical, electronic, and procedural safeguards that comply with federal standards to guard your nonpublic personal information, bla, bla, bla……"
To enforce this, during the day and each evening, I stroll the bank checking desks and work areas, making sure that each employee puts customer files and work papers out of sight of the cleaning people, service people and other customers while they are away from their desks or when they leave at night. Pointing out these issues sure makes me feel like a real nag. Until one morning I discovered that one of our employees had a bright idea to have some fun and help out on their own. What she did has now become a fun and very effective way of keeping the other employees in compliance with the new rules. "The Privacy Police were here and you have one citation"
Soon many of the employees were asking "Who are the Privacy Police?" and talking about citations that they received. It has been one month and the privacy police now lurk our halls and each day find fewer and fewer citations. This takes the nag out of this part of the regulation and at the same time has a little fun with the employees. Click on the links to see the sign, right click to "save as" or shop here to make it easier for everyone and stock up.